You(th) Decide NY aims to empower youth to make educated decisions regarding their gambling behaviors, and to prepare communities to work together to prevent underage gambling and reduce youth access to gambling. More than any other age group, adolescents are at the greatest risk for developing gambling problems. In the teenage years, our brains are undergoing a massive amount of change and development. It isn’t until around the age of 25 that the brain reaches maturity. The last part of the brain to fully develop is the prefrontal cortex, which is the area responsible for decision making and critical thinking. While still developing, the adolescent brain is being bombarded with a number of mixed messages about what is good and bad for them, as well as what activities they should and shouldn’t participate. They receive thousands of messages every day from their family, peers, community and the media. Korn et al (2005), worked with youth focus groups to examine the possible impacts of gambling advertising on youth knowledge, attitudes, beliefs and gambling behaviors. The youth involved expressed that a general theme of the gambling advertisements they were presented with portrayed gambling as generally harmless. In reality, youth gambling can cause a number of negative consequences: dropping grades, broken relationships with family, loss of trust, and an increased risk of developing a gambling disorder and other addictions. Increase youth awareness that media messages are constructed using specific techniques to convey meaning and affect the viewer/listener’s beliefs and actions. Help youth understand the realities and potential negative consequences of gambling. Decrease youth exposure to gambling and gambling advertising at community events, school, etc. Informational materials such as palm cards, brochures and posters. Facts about gambling and gambling addiction. Up to date news and research surrounding underage gambling. YOU(th) Decide NY was recognized for “Excellence in Prevention” at the 2016 National Conference on Problem Gambling. For more information about the YOU(th) Decide Project, click HERE to read the 2014-2015 Outcome and Activity Report. 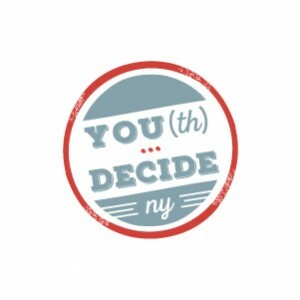 Visit You(th) Decide NY today to help give teens the power to decide!